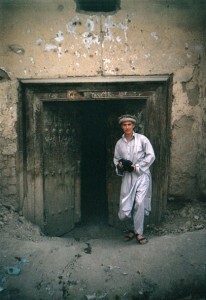 As you can see in the photo I had a very small video camera in Afghanistan. A Sony PDX10P, DV Cam. All my films have been made with small cameras, at first because of low or no budget. However, now I find the smallness of the camera gives me a low profile and a more intimate, fly-on-the-wall style. It also makes the people in-front of the camera relaxed so they can be themselves, rather than act-up to the camera or feel they have an expectation to perform. The more invisible I am the more real the documentary. I have no crew, no lights, just the camera with a good external mic mounted on top. Filming took place in 2003, just before the smallish HD and HDV cameras came on the market. Post Production took place in my home/office. Michael Norton, ex ABC editor saw what I was doing and encouraged me to edit it myself rather than get someone else to do it. I liked this idea as I felt that this time it was really my project and I needed to do it rather than let someone else interpret the footage. I spent 6 years part time working through 44 hours of tapes to get 50 minutes that we have. It was the hardest edit I have ever done with so many stories and issues to convey. What to leave out? What to put in? I had many sequences, but for a long time the film didn’t flow. Like a pack of cards I shuffled the sequences around until one day it all suddenly fell into place. Getting out of the way of myself was also a process in itself. Putting aside my own political and spiritual dogmas, and making sure that this wasn’t a film about pointing the finger of blame at anyone – except perhaps ourselves and the consent we have given our governments through our ignorance that has contributed to Afghanistan’s human rights issues. There were a few reasons why the editing took so long. Lack of funds to pay anyone to do it – including myself, meeting my future wife and starting a family, and the difficulty of the edit process, were all factors. Plus, when I tried to force the film to finish it wouldn’t work. I really had to surrender to the process and let it work through me. There was a time in the editing where I felt it was creating itself. In fact the entire project felt that way, right from the beginning. I always new that when the film would finally be released that it would be perfect timing. There was no sense of hurry in me except when I took on other people’s fears that it would be too late. My constant lesson is to surrender and not force anything. It will all happen if all is in ‘right order’. And it has, so far.